In all major cities world wide you will find city airports and regional airports. It is the same in Tuscany, where you find Pisa Airport, only 80 km from Florence, situated near the coast, which serves as Tuscany's regional airport and Florence Airport in the centre of the region which serves as the region's city airport. The distance between Pisa (airport) and Florence can be covered in only 45/60 minutes, depending of the means of transport used: train, coach or car (via the expressway or the motorway). Pisa Airport has easy access to the expressway as it does to the motorway, and the railway station at Pisa Airport is perfectly integrated into the terminal. Pisa "Galileo Galilei" Airport is registered as part of the Florence metropolitan area. What does it mean? 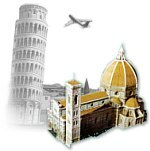 Simple: that in travel agencies all over the world, when you request Florence as your final destination, on their computer screen will appear flights arriving at both Florence and Pisa, and the same occurs for departures. What's the advantage? Simple: you have in front of you the complete range of flights to and from Tuscany, thus increasing your options, making it much easier to find the exact flight you are looking for. Florence, one of the most beautiful cities of art in the world, is only 80km from Pisa and easy to reach: you can choose from a range of options: the Firenze-Pisa-Livorno Expressway or the A11 Pisa-Firenze Motorway; the choice is yours, as they both have direct access to the airport. If you decide to take the train, you will arrive in Florence in an hour, where you will find an Air Terminal available for you to check-in for flights departing from Pisa Airport. 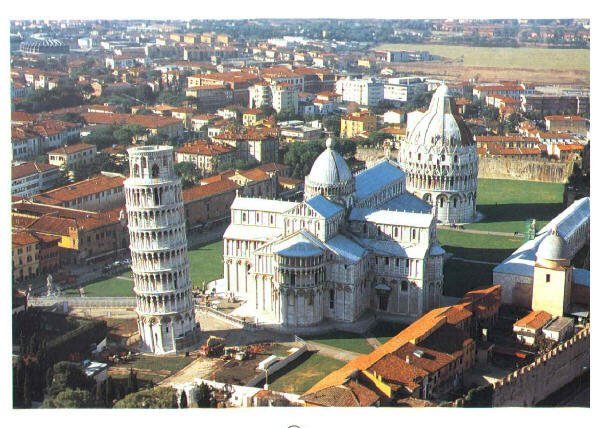 If you are flying for business, if you are coming to Tuscany for a holiday, if you are travelling to Italy or going on a trip abroad, Pisa Airport is your natural gateway: Tuscany is so much closer to your world. The airport is found on Tuscany's coast, south of Pisa, and only 2 km from the centre of the city and the famous Leaning Tower of Pisa, with direct access to expressways, motorways and railways. The ample availability of parking, car hire facilities, access to trains, the "Fly by Bus" service, taxis and the city bus service, makes the airport easily accessible with means of transport to take you to any location. Email at Giovanni for every question.